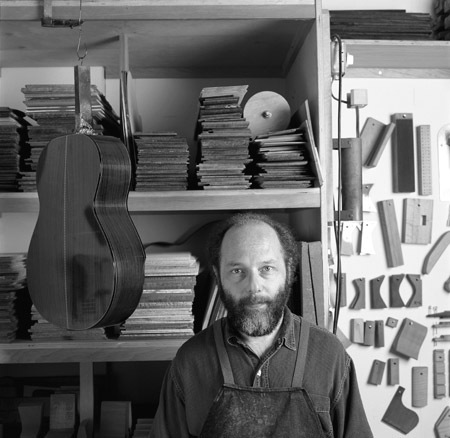 Photograph: Andrew Leyerle Grit Laskin has contributed to the centuries-old tradition of guitar making not only by preserving time-honoured techniques but by adding to them with innovative solutions to technical challenges. He endows his instruments with a powerful visual presence, imbued with wit and drama. Grit Laskin received his first guitar at the age of nine. By twenty, after two years of apprenticeship, he opened his own workshop to produce flamenco, classical, or steel-string guitars and related instruments. In nearly three decades he has produced over 550 instruments recognized by musicians as some of the finest in the world. Laskin, a musician himself, has created copyrighted innovation in the design of the tops and armrests of his instruments to make playing easier without sacrificing the quality of sound. In custom work, he is very concerned with the comfort and well-being of the player. 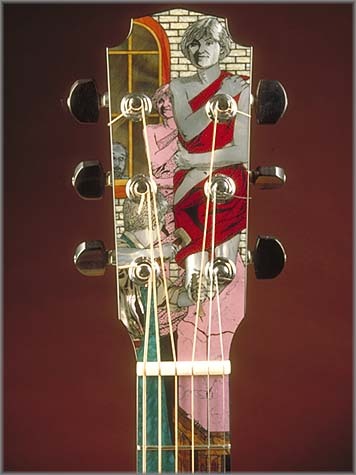 Combining art with acoustic science, Laskin's guitars are decorated with some of the finest inlay being done today. The necks and fingerboards are covered with narrative pictures created out of tiny bits of dozens of different woods, shells, bones and metals. 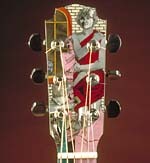 Each unique, they may add up to 150 hours to the production of the guitar. The designs, say Laskin, are of "average-looking people doing normal things", average including Rapunzel, Marilyn Monroe and Laskin himself. Grit Laskin is a sought after composer and performer with several CDs to his credit. He is a founder of Borealis, a recording company which promotes Canadian folk music, and of The Woods, Canada's best-known adult music camp. Laskin has been in films and television specials on the art of building musical instruments. He is an active member of the Ontario Crafts Council. A generous teacher, Laskin initiated and has twice been president of the International Association of Stringed Instrument Artisans, and has written a code of ethics for this craft. He gives lectures and demonstrations, has written many books and articles, and has created college curriculum for instrument makers and repairers.